They may not break into song, but these plush pals will provide interactive delight for your little one. Let's face it: Life isn't an animated feature where cute, English-speaking critters tend to your child's every need. But short of the full Snow White treatment, these plush pals will provide interactive delight for your little one. 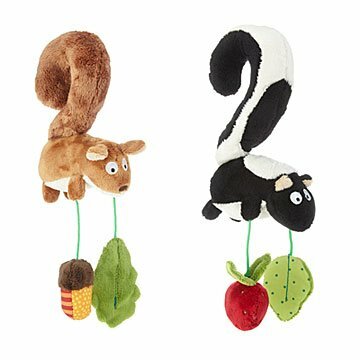 The sweet squirrel and skunk hang by their tails from stroller handlebars, car seat handles, or crib rails. They offer crinkling and rattling leaves, fruit, and acorns to engage your baby's senses with delightful details and will soon become inseparable companions for your little wood elf or forest sprite. Made in China. Great for keeping my granddaughter busy while in her car seat or stroller. Good quality. Adorable, no batteries, just something to hang on the car seat or stroller to entertain the kiddo. No batteries required!